My Domestic Monastery: Where Your Treasure Is...Moonjar!!! This post is sponsored by Moonjar. They generously sent us a Standard Moonjar Moneybox along with The ABCs of Money pocket-sized book. I'm happy to share with you a nifty little tool we'll be incorporating into our preschool time! I was impressed with this product and the possibilities it presented for further discussions about money. 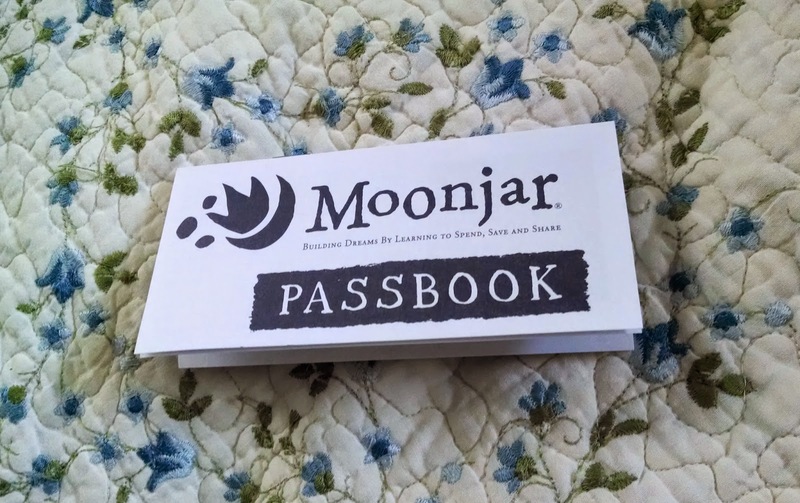 I really, really don't know where to begin with that conversation, but Moonjar gave me some helpful tools to get the ball rolling! I will say this from the get go - I think the older your kid is, the more they will appreciate this product. I think that it can work with a 3 or 3 1/2 year old (Therese really enjoyed it!) but it might need a little more explanation then it would need with, say...a 6 year old. But you can use it with a 3 year old, and I could see using this with an 8 year old (or older). So the range here is pretty wide! I think it is the kind of learning tool that grows with you. So, without further delay...my five favorite things about this handy little learning aid! I have a pre-reader. She knows her alphabet pretty well, but hasn't figured out reading yet. 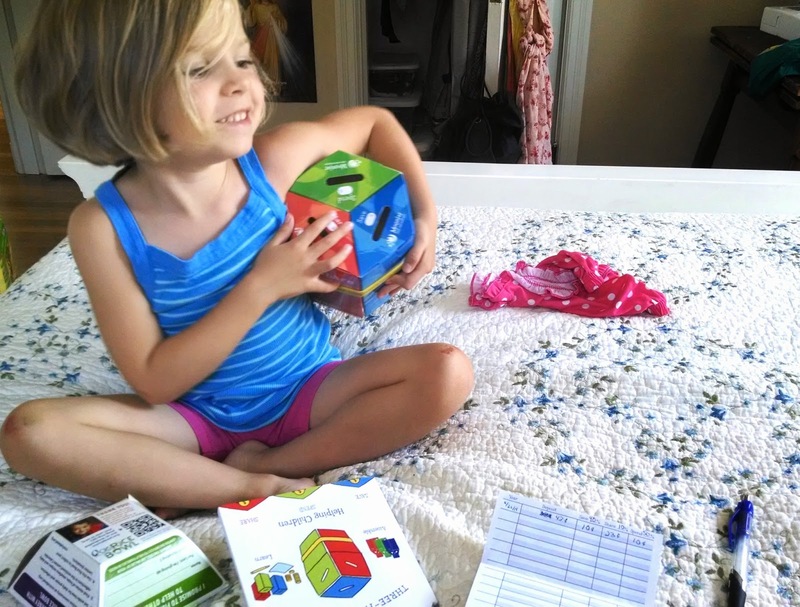 But the color-coded boxes caught her attention right away, and even though she can't technically read, she was trying to memorize which one was for "Share" vs. "Save" or "Spend" and the colors helped her keep track more easily. And let's talk about the terminology for a minute. 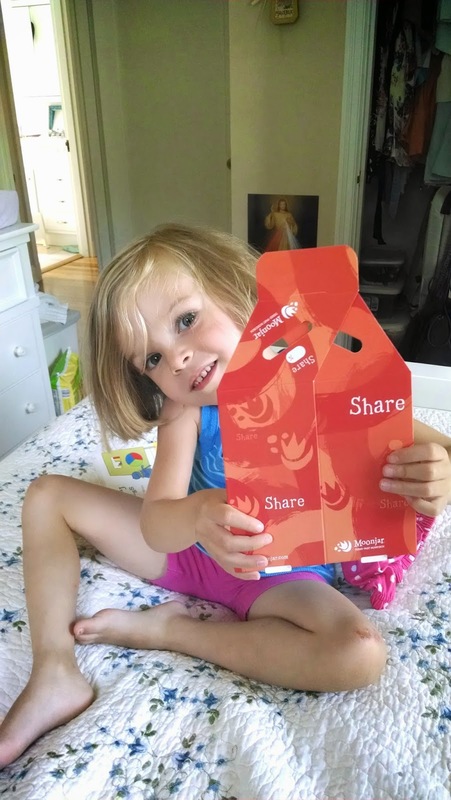 "Save, Spend, Share"...how catchy is that? I thought it was clever to use words that were short enough to be remembered by any kid. It also is just an attractive looking product. The colors are bright, but not obnoxiously so, and it assembles neatly enough to be not look out of place on a child's dresser. The assembly is also pretty kid-friendly. She was able to pop them all open into the correct shape and just needed help folding the flaps into place. I'd imagine if she were a year or two older she could have done it all by herself. It doesn't dumb things down. This is a big thumbs up in terms of homeschooling/Montessori criteria - this product presents the concepts without dumbing them down! Yes, there were a few things that I needed to explain a bit more, since my girl is still a little young, but I think that just reading through the materials will a slightly older child would be sufficient. My girl is awfully curious, though, and she was pretty intrigued by the concepts that Moonjar introduces. I wouldn't have thought to have a conversation with her about say, debt or investment...but we did! And she was fascinated. 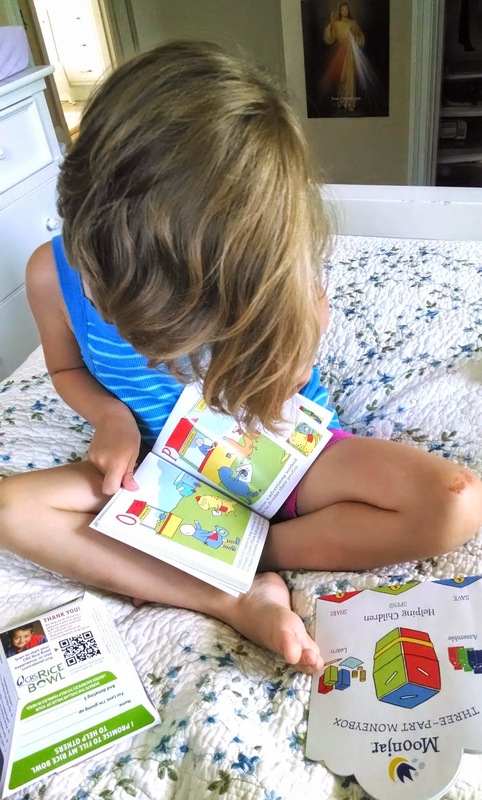 The adorable little book they sent along opened up the door for learning about something she may not have thought to ask about on her own. Anyone who has a child who's 3 years old on up knows that they want to be able to do things by themselves. Most young kids don't want you to just explain something to them...they want to do something with what you're explaining! They want you to do it with them! They want a tangible way to work with what you're teaching them. 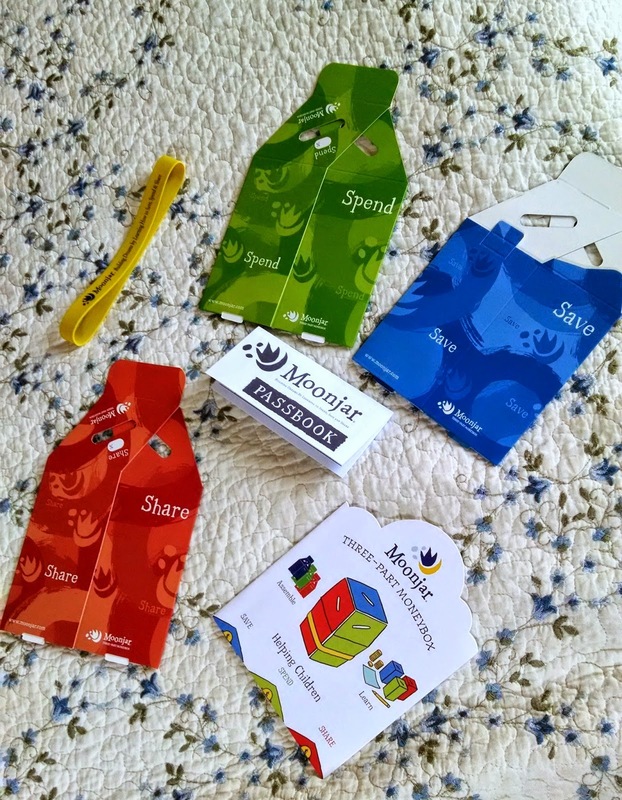 Moonjar does a good job of giving you several hands-on materials to help present the concepts to your child. The three little money boxes are evenly divided out so that your little one can see where their money is going and how it's being meted out. A little pocketbook is included that looks like a real little bankbook. Since my girl is still pre-writing, she couldn't fill it out herself but she liked filling it out together. She liked seeing the numbers I was writing and knowing that the numbers represented money that she had just put in her Moonjar moneyboxes. It's attractive and realistic looking. I'm not going to name names or link links, but I had kind of looked around for a product like this before, and the ones that I found were a tad bit gaudy. I liked the idea of a tool like this, but I didn't want to have something tacky sitting around. I love the simplicity of Montessori materials, and I find myself naturally drawn to products that follow suit. Moonjar definitely fits the bill. But I especially loved the little "Passbook." 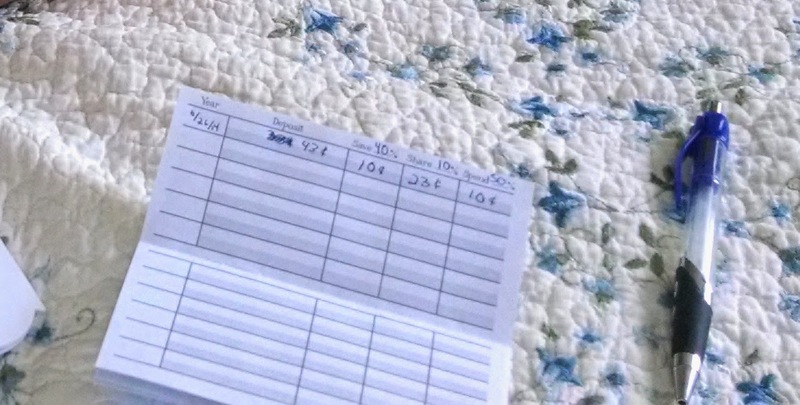 It really does look like a little bankbook! I love learning tools that look like the real thing. My girl is enamored with numbers these days, and I think this will be a great visual aide for her to keep track of her pennies. You guys know us. We don't call ourselves a "domestic monastery" for nothing. Our family's goal really is to learn how it is that all things point to Christ. It's a very Catholic thing to find how seemingly worldly things can actually be used "for the greater glory of God." And I want my girls to see money that way. I want them to see themselves as stewards of what they have and to choose to use it wisely. We all know the parable of the talents. I don't want my girls burying the "treasure" they have. I want them to know how to use it wisely! I want them to know how to spend what needs to be spent - to invest in things that matter and things that they and their family need. I want to teach them that there is a healthy way to save money, too - to wisely put aside the resources God sends their way in such a way that they can eventually afford what they need without living outside their means. I think delayed gratification is an invaluable lesson in growing in virtue, and saving rather than borrowing money because you want it now is a great way to learn that. And of course...sharing. Andrew and I both came from very generous families, families that didn't think twice about giving what they had to those in needs. We want to follow our parents' examples and be the same way, and we want to teach our children to do the same. Because their money...ultimately not their own. All that they have is a gift from God, and part of being good stewards of what they've been given means that they need to be willing to share what they've been given with others, even if it means less for themselves. So yes...two thumbs up for Moonjar!! How fun! John Paul would love something like this, although he still puts every. single. coin he finds into the poor box at church. It's so sweet! This is encouraging. I loved your older (not most recent) book so much, by the way. I hope to read the other, newer one too. Thanks for sharing, I never heard of this before. I'm thinking it would be a great stocking stuffer.